My daughter’s birthday is coming up and one of her favorite meals is bbq ribs with fries and coleslaw. With that in mind, I thought it was high time to rework and revisit this old recipe from way back when. These have to be started the day before for best results. Start by making the barbecue sauce. In a 2 quart sauce pan combine the ketchup, vinegar, molasses, honey, liquid smoke, salt, garlic and onion powders and Tabasco. Whisk it all together until it is smooth, and then simmer it uncovered for about 30 minutes. Cut the pork ribs into 4 roughly equal pieces. Use about a third of the barbecue sauce to coat the raw pork ribs. Wrap each coated rack of ribs tightly in a large sheet of tin foil. Refrigerate the ribs overnight. The next day, place the foil covered ribs into the oven and bake them at 300° for 2-1/2 hours. This will cook them through and make them very tender. Remove them from the oven and take them out of the foil. Coat them again in the barbecue sauce and grill or broil them for about 2 to 4 minutes per side. Be careful not to scorch them, because they will burn quickly. Serve accompanied by more barbecue sauce on a table lined with newspaper. Eat the ribs and toss the bones in the center. When you are done, gather up the newspaper and bones and toss the whole mess into the garbage. This recipe serves 2 heartily, or 4 with conservative appetites when it is made with regular pork ribs. 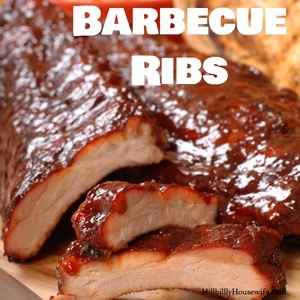 When made with the less expensive country style ribs it will serve 6 easily. This is my favorite way to make a company dish out of lowly country style ribs.